Why is blood red? What is in it? Every kid that has scraped their knee or cut their finger will probably want to know more about blood. Even little kids want to learn the facts about their bodies and what goes on inside. This past week my whole family has been fighting a nasty cold/virus that turned into pneumonia. I thought this was a good time to discuss our body's defense mechanisms and specifically talk a little bit about blood. Plus, its getting closer to Halloween and I thought it might be helpful to also discuss real vs. pretend in case the kids accidentally see something frightening like a blood thirsty vampire. So our science Sunday fun revolved around blood today - real and fake. We learned about the make up of blood and especially concentrated on white blood cells because they help fight infection. After learning all about blood we made some fake blood using a recipe we found in The Worst Case Scenario Survival Handbook: Gross Junior Edition. While this recipe is not available online, several Fake Blood Recipes can be found at Steve Spangler Science. While my kids thought it was fun to mix up all the ingredients and stir the fake blood, they didn't want to touch it at all or taste it (it's edible). We all expected the concoction to look more red. Our mixture had a really muddy brown color in the mug and didn't look like blood at all until we took it out of the mug and put some on our cotton cloth. The kids also commented that the fake blood smelled like chocolate Pop Tarts - it really does! We talked about the differences between fake blood and real blood and talked about instances when people might use fake blood. If my kids were older, I'd probably talk a little about blood types or try out some of the other recipes to see which looks the most realistic. Our recipe made way more blood than we needed, so I'd recommend halving most recipes unless you have a need for a ton of fake blood. 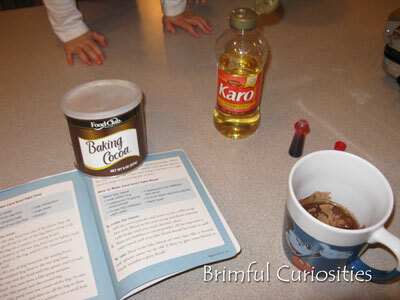 They really enjoyed this simple and easy to conduct kitchen science experiment. 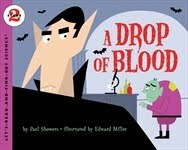 This week we hope to check out a Let's-Read-and-Find-Out Science book called A Drop of Blood by Paul Showers, illustrated by Edward Miller from the library. It looks like an informative and fascinating science book for kids and the cover art is perfect for the upcoming Halloween weekend. If you enjoyed this post you can find more Science Sunday experiments involving kids at http://adventuresofmommyness.blogspot.com/2010/10/science-sunday-why-do-water-striders.html or even join in the weekly meme. Science is Fun! I hope you're feeling better! This looks like a great lesson plan. 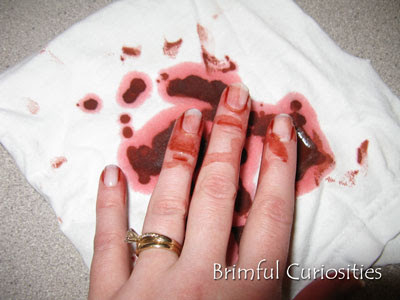 The fake blood really does look pretty real. We like the "Let's Read and Find out" series. The Magic School Bus also has a couple of good books and videos on blood circulation and blood cells if you like that series. This brings back so many memories. My brother used to make fake blood ALL the time! sounds really neat! if we get there, i'll def. do this with my kids! Very timely, seasonal, science lesson. I hope the pneumonia gets better - that sounds very serious! Very cool! I love experiments like this when everyone is involved. I hope your family is feeling better. Thank you for the links for the recipes. I am very interested to hear more about the book Drop of Blood I enjoy this series. I have never heard of this book before. Thank you for sharing. I saw the photo before reading the post and thought there was a serious injury! Yikes, that looks real!